Professor, PhD in Geology and Mineralogy. For more than 20 years has been teaching petrographic courses in crystalline (igneous and metamorphic) and sedimentary rocks. 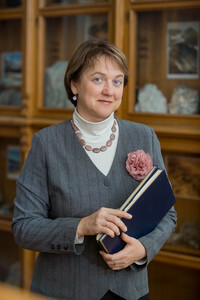 Her area of expertise embraces the investigation of the reservoir sedimentary rocks in different Russian oil fields, especially within Tomsk Oblast, Siberia. Lyubov has been involved in numerous projects and grants in collaboration with various Russian petroleum enterprises. She has also participated in gold exploration projects of leading geological organizations.